Babesta is one of my favorite neighborhood boutiques and that is why i am so excited to have been able to interview founder and owner, Jennifer Cattaui. For years, Jennifer has been introducing parents to trendy children’s wears that conjure up a bit of funky urban culture, connecting downtown New York style with independent artists and designers. Babesta gives style-savvy parents an alternative to the typical designs of baby and toddler clothing and accessories. From boutiques across the country, these are the “musts” for your little ones style file. 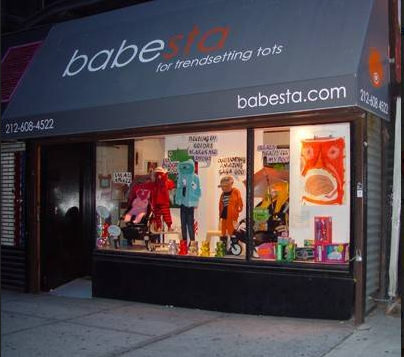 if you don’t live in or near NYC, check out their site at babesta.com. Please tell us a bit about yourself: Formally a tax attorney, this has been an atypical career trajectory. After graduating law school, I worked as a consultant at Ernst & Young in NY. I moved to Paris for some years, and then came back and got into magazines. I worked at several magazines, and eventually started Babesta. Now I run Babesta (with the help of an amazing team), but also work as the Editor-in-Chief of Earnshaw’s magazine, a 94-year-old children’s apparel business magazine. I have two beautiful girls – Amina (7) and Camille (5) and a wonderful husband (11 years married, who acts as our accountant on the side). It’s all a family affair. What inspired you to open Babesta? It’s a familiar story – I was pregnant with my first daughter in 2004, and was working for a fashion magazine. I was looking everywhere for cool clothes that reflected me and my tastes. I found a couple small run tops and outfits at local stores in my neighborhood, designed by a neighborhood artist. I started collecting cool things I’d find wherever I went. Eventually I put them together in a lookbook online, which turned into an e-commerce site. We’ve grown organically ever since. What do you look for in clothing/accessories companies when buying for the boutique? I look for goods that are unique, fun, high quality and nod to pop culture. I look for small labels, new labels, with amazing creative designers behind them. Everything is hand-picked from designers all over the world. Everything also has to be low maintenance – no special washing instructions or dry cleaning. Who has time for anything else. What advice would you give to parents shopping for their children? Do you find that most parents take the same stylistic approach with dressing their children as they do with themselves? Keep it fun. There are so many amazing brands out there – support these great artists and designers that put so much work, time and love into every design. I find that parents do extrapolate their own stylistic sensibility to their children’s wardrobe. I sure do! Check back next week as we unveil Jennifer’s top brands, wardrobe essentials and trends for the upcoming Spring/Summer 2012 season. This entry was posted in interviews, source for style by Little Style Finder. Bookmark the permalink. Thanks for the great interview Ehrin! I just posted on our FB & Blog. Good luck with all! The blog looks great & I love the illustration –so fun! Thanks Jennifer! Looking forward to posting Part II.